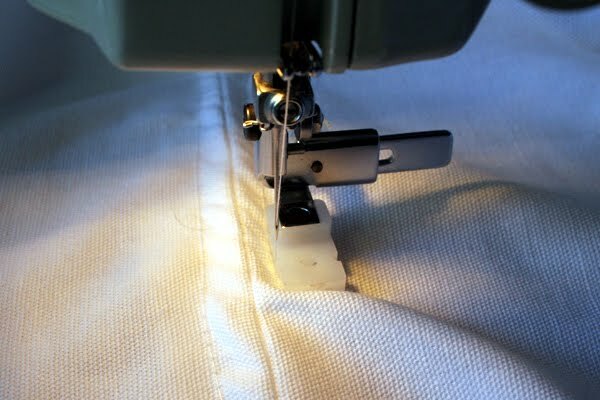 While the interwebs is curiously silent about how to install a zipper foot, there are tons of tutorials on how to sew a zipper. You could skip this whole thing and visit Sew, Mama, Sew!, which was my font of enlightenment. There are regular zippers and invisible zippers. Right now, I only know the regular. When I get further educated, I'll let you in on it. 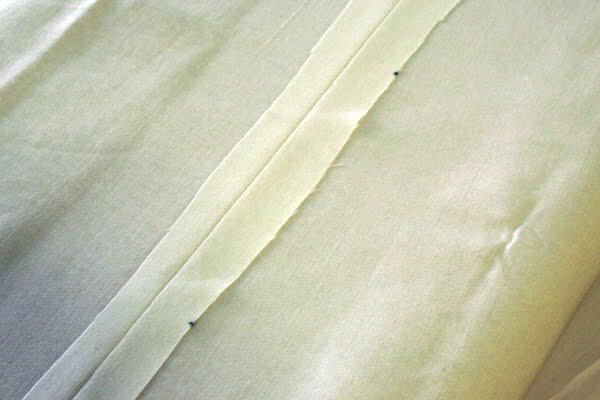 Step 1: Sew your two pieces of fabric together along one seam where the zipper will go, leaving about an inch seam allowance. 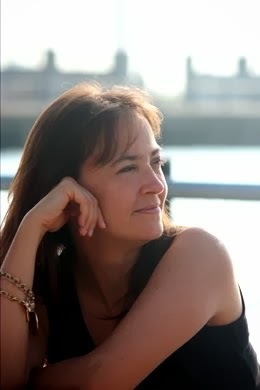 The right sides (e.g. nice sides) of the fabric should be facing in. Important: Use a longer stitch since you will be ripping this seam out. Press the seam open. Step 2: Lay the zipper face side down in the middle of the seam. 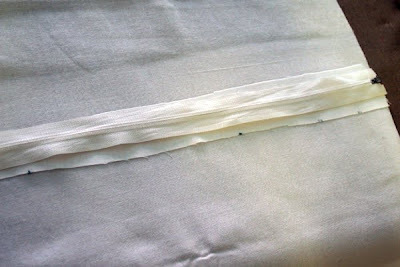 Using a glue stick or fabric glue, apply a little glue to each side of the zipper. Try not to get glue on the zipper teeth. As you roll the zipper down, make sure it's positioned right on the seam. 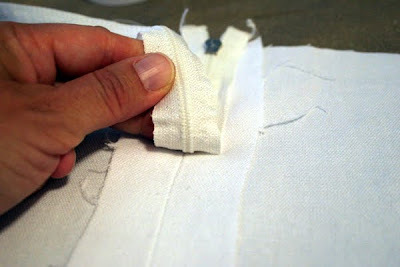 Run an iron over both sides of the zipper to help seal the glue. At this point, I found it helpful to put the zipper aside so the glue could set. Step 3: Turn the seam over so you are looking at the nice side of it. Rotate it so you start sewing at the top of the zipper. Consult my previous tutorial as to how to position the seam and zipper foot. Basically sew down one side and up the other. (Back stitch at the beginning and end.) 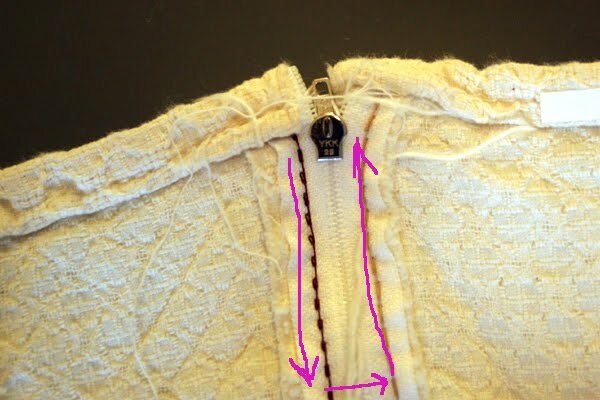 When you get to the botton of your zipper, you can leave the needle all the way in, lift the zipper foot and make a 90-degree turn, sew across the zipper, lift and make a 90-degree turn and start back up the other side. You are sewing a big U-turn. See the photo below for a glimpse at what is going on with the bottom side (e.g. unfinished/ugly side of your zipper). Note the helpful sewing directions in pink. Step 4: Holding the nice side of the zipper up, use a seam ripper to rip out the big stitches you made earlier. Underneath will be your zipper. Put the right sides of the fabric back together again and continue with sewing the rest of your seams. Turn the fabric right side out through the zipper opening. Am pinning this on Pinterest for when I actually break out the sewing machine!